Kellie always coaches with a smile, but don’t let that fool you. During her sessions she manages to sneak in 100s without you even noticing, and then ask you to swim faster. And you will. At the same time she will bend over backward to help you improve, to motivate you to be a better swimmer, and to bring you into the Aqualicious family. Most people see Anthony’s soft-spoken side – until he’s poolside coaching. He runs his sessions with military precision. You will work hard and do plenty of drills, and you will receive well-considered advice on stroke correction. Anthony cracks the odd joke now and then (which are probably all very sharp and witty) but most people can’t understand what he’s saying. Trudee coached Aqualicious from 2008 to 2016, and over that time she became an integral part of the Aqualicious family. She began swimming at the age of 8 and until she was 23 she swam under the direction of Coach Ken Wood at Redcliffe. More recently she has swum with Michael Bohl at St Peters Western. She has competed in two Australian World Cup pool teams and has been a member of the Australian Open Water team from 1999 until 2007. Trudee was part of the gold medal winning team in the 25km team event at the 2005 World Open Water Swimming Championships in Montreal, Canada and placed 5th in the 10km individual event at the 2006 and 2005 World Open Water Swimming Championships. Trudee was named as Australian Female Open Water Swimmer of the Year in 2003 & 2005 as well as the Australian All Star Team in 2006. She is now working fulltime at Swimming Queensland and is a member of the Metropolitan Caloundra Surf Life Saving Club. Along with coaching Aqualicious, Cedric coached at Brisbane Girls Grammar, and has previously worked in Europe with swimmers who went on to compete in the Paralympic Games. He had a high level of technical coaching skills, and we were very sorry to see him move away from Brisbane. Nicole joined Aqualicious in 2013 as a coach, and brought with her great passion and team spirit. She worked us hard in the pool, making us hope she would lose her voice so she couldn’t add more pyramids or 200s to the set. The harder she worked us, the more we thanked her, and looked forward to her next session. Jodie was the president of Aqualicious in 2013, and brought her teaching background poolside. There was be no acting out or slacking off, but there was fabulousness and team spirit! When Jodie was coaching you had the feeling that most sessions would end up like a dance routine in an episode of Fame. Lawrie Fabian was the Aqualicious head coach from 2005 until 2013, and his coaching and mentorship helped Aqualicious grow into the established Masters swimming club it is today. He was the recipient of the 2007 AUSSI Masters Qld Coach of the Year, and again in 2008. Lawrie was founding president and coach of Melbourne’s Glamourhead Sharks Aquatic Club, the first gay and lesbian swim team in Victoria. He has coached swimmers and triathletes to personal bests at World Masters Games, The Gay Games, and has had one of his triathletes selected to compete for Australia at the World Triathlon Championships in Mexico City in 2002. He has been competing in Masters swim meets since 1991 and has completed 20 Olympic distance triathlons since 1988. 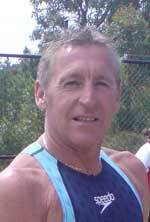 In 2007, Lawrie successfully coached Team Aqualicious to the Club Champions Trophy in the Queensland State Short Course Championships in Noosa, and again in 2010 in Cairns. Under him the club won the State Long Course Championships in 2012 in Hervey Bay.